This event has been re-scheduled for June 11th due to the tornado outbreak in April. 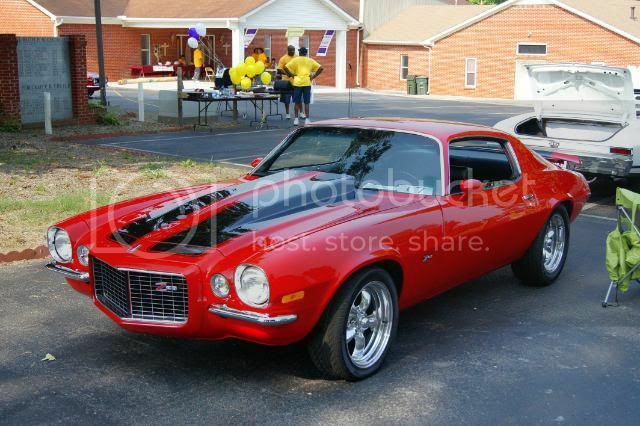 Car Show Fundraiser for The American Cancer Society. $20 Registration Fee - Cars, Trucks, Motorcycles Welcomed!!! Each entry will be eligible to win one of the following Door Prizes: Kindle Wifi E Book, iPhone, Flat Screen TV, Tools and Cleaning Supplies. Judging by "People's Choice" and trophies will be awarded. A Silent Auction will also be held where guests can bid on an Auburn Football autographed by Coach Gene Chizik and an Alabama Football autographed by Coach Nick Saban, along with many other items. Moon Bounce and free cotton candy and popcorn for the kids. Grills will be smokin with some of the best BBQ in Huntsville. A fun-filled day for the entire family. Travel North on Memorial Parkway through Meridianville and turn left at the next traffic light just past Meridianville Middle School on Grimwood Road...church is about 1/2 mile on the left. See you there!!! 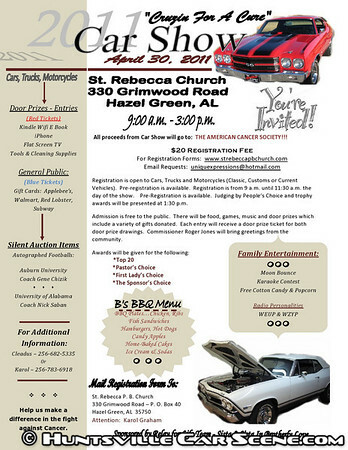 Registration is $20 and is open to Cars, Trucks, and Motorcycles (Classic, Customs, or Current Vehicles). Pre-registration is available. Registration is from 9am until 11:30am the day of the show. Judging by People's Choice and trophy awards will be presented at 1:30pm. Admission is free to the public. There will be food, games, music and door prizes, which include a variety of gifts donated. Each entry will receive a door prize ticket for both door prize drawings - Car Entry and one for the General Public. 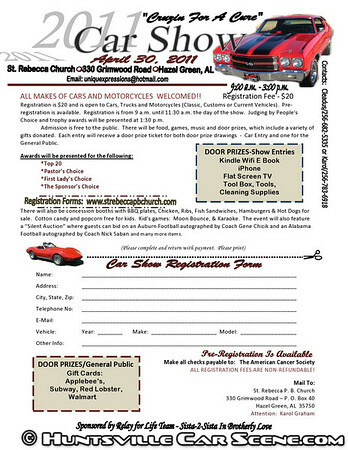 Show entry door prizes includes a Kindle wifi eBook, iPhone, Flat Screen TV, Tool Box, Tools, and Cleaning Supplies. General public door prizes include gift cards from Applebee's, Subway, Red Lobster, and Walmart. There will also be concession booths with BBQ plates, Chicken, Ribs, Fish Sandwiches, Hamburgers & Hot Dogs, Candy Apples, Home-Bakes Cakes, Ice Cream and Sodas for sale. Cotton candy and popcorn free for kids. Kid's games: Moon Bounce and Karoke. The event will also feature a silent auction where guests can bid on an Auburn Football autographed by Coach Gene Chizik and an Alabama Football autographed by Coach Nick Saban and many more items. 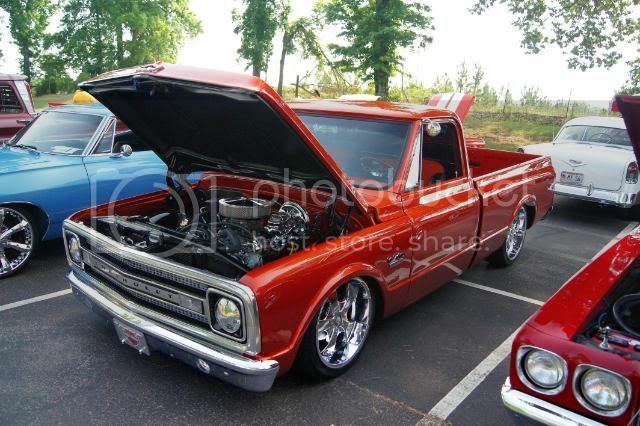 JDRF Charity Car Show on 4/20/13! Went by and nobody there which is to be expected with recent weather damage and power outage. 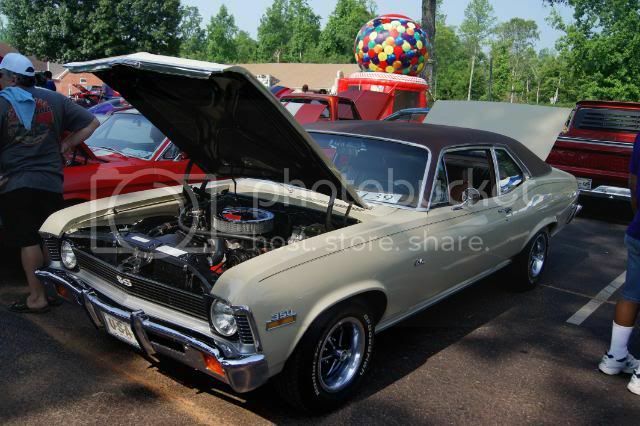 Show organizers can PM me if interested in a free space at the "drive in together for a cure" car show on June 25th. I think it is safe to assume that all events are canceled until further notice. needs to cut some fenders to lay his baby out! "I don't care how many times I've heard "I'm done," no one is ever done. You are in this for life. Come girlfriends, wives, kids, or even unemployment, your heart will always be in love with wheels. And so will the rest of us. We all share the same disease." "Wise men aren't really wise--they've just been around long enough to see everything!" Sounds like a great show.......who's going?? So far, there's only one on the attendance list, but I think people just haven't marked that they're attending yet. I have to check if there's any more events for this weekend, but haven't had a chance to do that yet. Our club has some guys planning to go!! Samir are you going to be at the show on June 11? question..............is there any shade and can we put up our canopy tents?? I probably won't be out at any events this weekend. I will be spending it with family. Too Bad I hear this is going to be a "reallly big shoe"
Hey this was a great show run by some very nice folks!!! the Limestone Co. Mustang Club guys had a great time........thanks!!!! I agree with slowjoe24. We didn't enter the show but had a great time as spectators! Kudos to the volunteers of the St. Rebecca Church! Looked like a great event! Thank you for the pictures Jeff!